Nordic is pleased to release the dates and times for the 2016-2017 season. The tryout dates/times are listed below by age bracket. Please mark your calendars today so players can be sure to attend both try-out sessions. We will be selecting teams for the 2016-2017 season based on birth year as per the new US Soccer guidelines and adopted by the Vermont Soccer Association. We will be announcing our coaching staff for the 2016-2017 season at a later date; however, you will go into tryouts knowing who your coach will be for the 2016-2017 season. 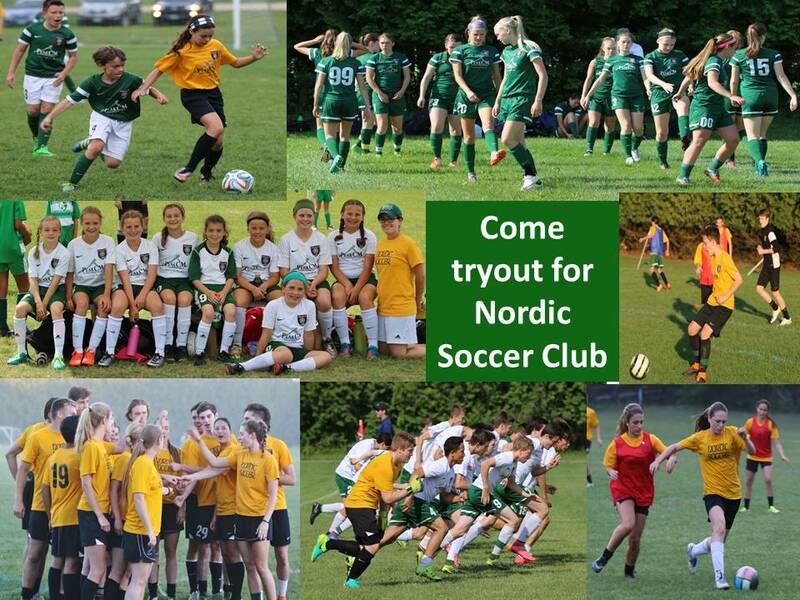 Our primary goal at Nordic is to continue to offer our players the best coaching staff of any club in the state of Vermont. We are very proud of our coaching staff. The feedback we recently received from our players and parents in the club-wide survey certainly highlight the high-caliber of our coaching at all age brackets and genders. 2008 Boys - Monday July 11th, 5pm to 6.15pm and Wednesday July 13th, 6.45pm to 8pm. 2007 Boys - Monday July 11th, 5pm to 6.15pm and Wednesday July 13th, 6.45pm to 8pm. 2006 Boys - Monday July 11th, 5pm to 6.15pm and Wednesday July 13th, 6.45pm to 8pm. 2005 Boys - Monday July 11th, 5pm to 6.15pm and Wednesday July 13th, 6.45pm to 8pm. 2004 Boys - Monday July 11th, 6.30pm to 8pm and Wednesday July 13th, 5pm to 6.30pm. 2003 Boys - Monday July 11th, 6.30pm to 8pm and Wednesday July 13th, 5pm to 6.30pm. 2002 Boys - Monday July 11th, 6.30pm to 8pm and Wednesday July 13th, 5pm to 6.30pm. 2001 Boys - Wednesday July 6th, 6:30pm to 8:00pm and Thursday July 7th, 6.30pm to 8pm. 2000 Boys - Wednesday July 6th, 5pm to 6.30pm and Thursday July 7th, 6.30pm to 8pm. 1999 Boys - Wednesday July 6th, 5pm to 6.30pm and Thursday July 7th, 6.30pm to 8pm. 1998-97 Boys - Wednesday July 6th, 5pm to 6.30pm and Thursday July 7th, 6.30pm to 8pm. 2008 Girls - Tuesday July 12th, 5pm to 6.15pm and Thursday July 14th, 6.45pm to 8pm. 2007 Girls - Tuesday July 12th, 5pm to 6.15pm and Thursday July 14th, 6.45pm to 8pm. 2006 Girls - Tuesday July 12th, 5pm to 6.15pm and Thursday July 14th, 6.45pm to 8pm. 2005 Girls - Tuesday July 12th, 5pm to 6.15pm and Thursday July 14th, 6.45pm to 8pm. 2004 Girls - Tuesday July 12th, 6.30pm to 8pm and Thursday July 14th, 5pm to 6.30pm. 2003 Girls - Tuesday July 12th, 6.30pm to 8pm and Thursday July 14th, 5pm to 6.30pm. 2002 Girls - Wednesday July 6th, 6.30pm to 8pm and Thursday July 7th, 5pm to 6.30pm. 2001 Girls - Wednesday July 6th, 6.30pm to 8pm and Thursday July 7th, 5pm to 6.30pm. 2000 Girls - Tuesday July 12th, 6.30pm to 8pm and Thursday July 14th, 5pm to 6.30pm. 1999 Girls- Wednesday July 6th, 6.30pm to 8pm and Thursday July 7th, 5pm to 6.30pm. 1998-97 Girls - Wednesday July 6th, 6.30pm to 8pm and Thursday July 7th, 5pm to 6.30pm.